When the weather begins to cool, our first instinct is to reach toward the thermostat and turn on the furnace. We rely on our furnaces to keep our homes warm and liveable during even the coldest months. But what if you power on your furnace, and instead of warm air, you get nothing at all? Your heat exchanger is one of the hardest working parts of your HVAC system, and as such, it is prone to its share of problems. The Heat Exchanger Experts have seen everything there is to see when it comes to problematic heat exchangers. In today’s blog, we’ll outline some of the common problems that homes face when the first turn on their heaters for the winter seasons. Before we get too far into exploring these problems, it’s always worth addressing how to prevent them. Regular inspections on your HVAC system can keep your furnace running smoothly all winter long, and can prevent breakdowns on those bone-chilling days. By arranging for a pre-winter inspection every year, and staying on top of replacing your filters, you can enjoy the benefits of a fully-functioning heater whenever you need it most. Of course, if you’ve failed to schedule regular maintenance for your furnace, you may be experiencing one of the following problems. As we discussed in our last blog, the size of your furnace can make a difference in your home. Despite the thinking that a larger furnace is better for your home, this couldn’t be further from the truth. In fact, a furnace that is too large for your home is prone to more problems than a properly sized furnace. Big furnaces in small homes suffer from a process called short-cycling. The furnace rapidly turns itself on and off because it thinks it’s heating a much larger home. This leads to more fuel being expended to constantly push spurts of warm air into your home. This on again off again process also wears out the components of the heat exchanger faster. This leads to higher utility bills and steeper and more frequent repair bills for your oversized furnace. 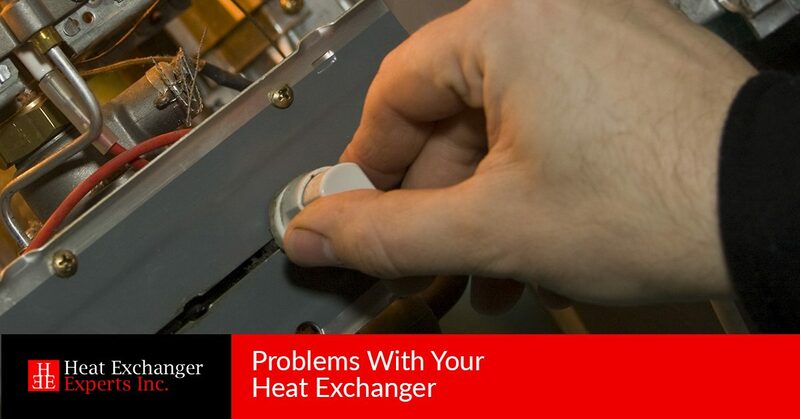 This is a frequent problem for heat exchangers of all sizes and makes. With time, materials and objects may settle on the conducting surfaces of the heat exchanger itself. These objects could be as small and fine as a grain of sand, it could be algae, dirt, or even rusted flakes of the heat exchanger. By resting on the conducting surfaces, they prevent the exchanger from completely transferring heat from one medium to the next. Fouling can block internal tubes that the heat exchanger uses to heat up the air. The result is that the heat exchanger has to work harder to heat the air. This causes an increase in the utility bill as more fuel and energy is used. In some cases, the fouling can be so bad that it prevents the exchanger from working at all. Easily the most common problem that heat exchangers experience, cracks are the result of repeatedly overheating and cooling the exchanger. This process of unrelenting heating and cooling stretches and stresses the metal of the exchanger. These stressed points crack open and cause further problems. If you’re starting out in the HVAC field, you already know that knowledge is power. Heat exchangers are a surprisingly nuanced piece of equipment, and you’ll want to know the best ways to address their problems and then fix or replace them. You can learn all of this and more with the Heat Exchanger Experts. At each of their traveling seminars, they’ll provide you with the opportunity for hands-on learning, examining more than 50 field tested and damaged heat exchanger units. These seminars are invaluable for HVAC technicians. Find the nearest seminar and sign up today!